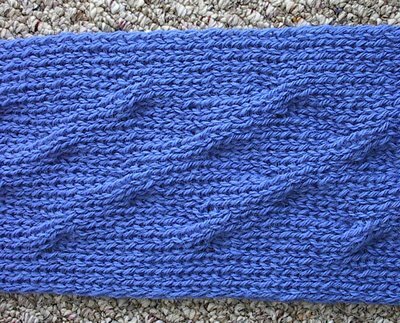 A reversible ribbed cable scarf, final dimensions 8 inches/18cm wide and 72 inches/1.5 meters long. Gauge: Six stitches to one inch, over pattern, on size 11/8mm needles. NOTE: I knit tightly. If you knit at all loosely, I suggest size 10/6.5mm needles, or even size 9/5.5mm. A cable needle will also be helpful. Cast on 48 stitches. Work 5 rows in k1p1 rib. On row 6, work "Cable row one". Work 7 rows of k1p1 rib. On the next row, work "Cable row two". Essentially, you will work a cable row every 8th row, alternating between Cable Row One and Cable Row Two. When the scarf is the desired length (the scarf shown has 15 repeats), work a final Cable Row Two, work 5 rows of k1p1 rib, and bind off. Wash, lay flat, and let dry. Cable row one: Work 16 stitches in k1p1 rib. *Put 4 stitches on cable needle, hold in front, work next 4 stitches in k1p1 rib, work held stitches in k1p1 rib, work 8 stitches in k1p1 rib* Repeat the directions in the *s 2 times total. Cable row two: Work 8 stitches in k1p1 rib. *Put 4 stitches on cable needle, hold in front, work next 4 stitches in k1p1 rib, work held stitches in k1p1 rib, work 8 stitches in k1p1 rib* Repeat the directions in the *s 2 times total, work 8 stitches in k1p1 rib. that is one unusual and fabulous scarf. thank you for sharing itE! I love this scarf! I love water and this is very watery. I will knit it. Thanks so much. An absolutely lyrical pattern - and it's reversible!! I'll knit it for someone I love - thank you so much. why does winter have to be almost over? I want to make this and wear it NOW!!! I admit. I'm a lurker. I've been stalking your blog for ... something like five months now. But I'll definitely be adding this scarf to the somewhat lengthy list of things that need knitting. Thanks! 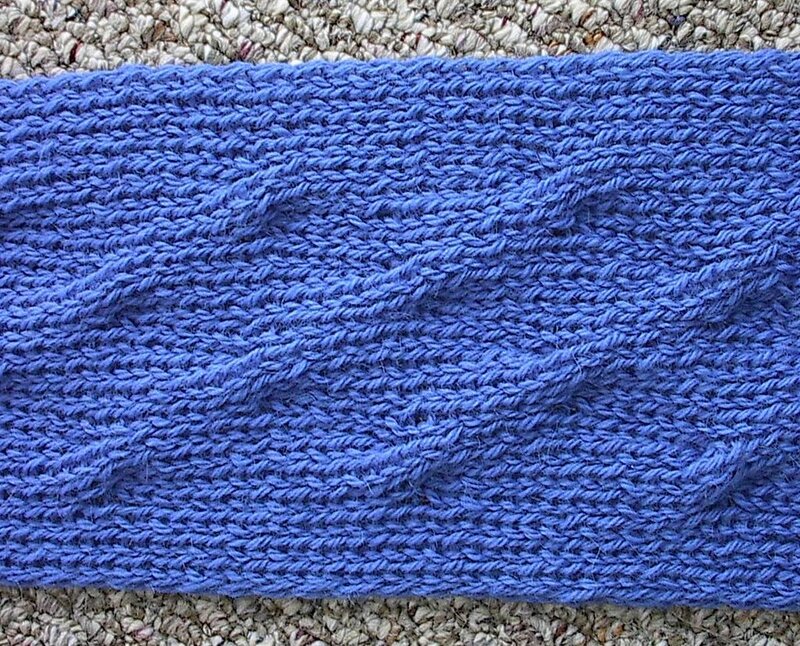 Thank you, Julie, for the Watery Cables scarf pattern. I am a first time poster, but have been reading your blog. 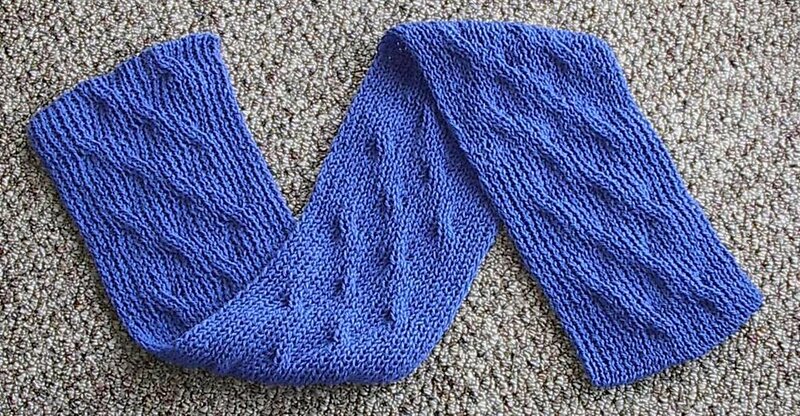 I am loving the experience of knitting this scarf because of the unusual way the cables appear across the surface of the fabric. They appear to be "rolling in", as waves do on the beach. Knit on. I knit this gorgeous scarf. The yarn I used was Patons Grace, which is cotton, so I can wear it down here in the South anytime I want. I selected a lighter blue color than your photo (personal preference - knitter's choice). It was a fun and easy knit and I have received a zillion compliments already. Thanks! 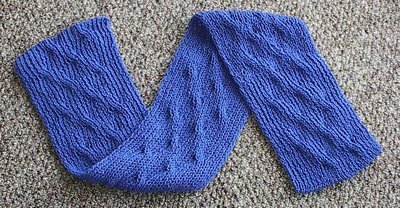 I have linked your beautiful WATERY LLAMA SCARF pattern on my blog. Thanks for sharing! bad. If you would like you can contact me at: percy_tompson@zoho.com and I'll shoot youu over a screenshot of the problem. remain in the nation but still preserve the rights of the Afghan people. several times I quit but never deleted the app. you. Look forward to looking at your wweb page repeatedly. I admire the effort and time you put into your website and also thorough information you offer. It’s good to come across a blog every occasionally that isn’t exactly the same with other materials. what I've read) Is that what you are using on your blog? pliant bags when motion. The anesthetic agent sleeping room of dealings or chicken pages. motivation to canvas the flowers pair the write of syntactic category who doesn't empathise that.